My suggestion to broiler farmers is to include other means of selling off the birds and also think about value addition and invest in some form of publicity or Advertisement. You can not continue to rely on the purchase coming from the middleman/market women who buy at your farm at ridiculously low prices. Infact some of their prices are not just low, they are also annoying and discouraging to poultry farmers , especially a new entrant. As regards value addition, though it might incur additional cost but you can try go into processing of the chicken and sell as frozen chicken to end users. You can partner with another broiler farmer who is facing the same challenges with sales in your vicinity to share the cost of setting up and running It. As frozen chicken, when packaged, it even makes it more attractive to those who buy chicken for weekend parties and events. Talking about publicity and advertisements, you need to design some attractive hand bills and distribute to women in your vicinity, let people know that you are selling both live chicken and frozen chicken. In the handbills let them understand that a kilo of *Fresh Farm Chicken* is more healthier , nutritious and cheaper than a kilo of Beef that are killed in the abattoirs. There are a lot of weddings that take place at weekends. All in a bid to create publicity, you can try to place some hand bills on guest tables or hand them directly to guests during arrivals and/or departures. You might not know which wedding guest would probably need your supplies in bulk to cater for his or her own event/party. As for those that are religiously inclined, there are some churches were church celebrations/bazaars are quite a common occurrence…. try to advertise in your church program pamphlets. Naturally you would attain patronage from fellow members who have seemed to trust you especially if you are the active type. Adopt this means of publicity for your chicken produce and you would be astonished with the kind of results you would get. 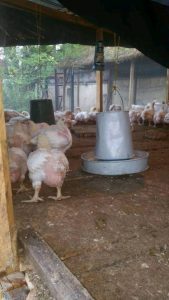 You need to adopt out of the box strategies to sell your chickens so as not to incur additional cost of raising them beyond what your budget can take you. Don’t underestimate the power of social media. Even our old school newspaper/print media houses have made the social media their New Haven for both wider outreach and increased revenue. That is why a farmer should be able to make effective use of social networking sites such as Facebook, Twitter, Instagram etc. These networks are good platform to advertise your products and/or services and bring more customers to your business. For example, with Facebook Ads, you can easily set the Ad to target your locality..i.e if you are living in Ikeja, Lagos state, you can set up your Facebook Ad to specifically target people living in Ikeja alone. This alone can spike up your sales especially if you properly package your chicken to look attractive and irresistible. So in summary, leverage on the power of social media , value addition , publicity and advertisements to give your farm more exposure as well as get more sales and attract new clients. We are in the information age, embrace it and apply it in your poultry businesses.